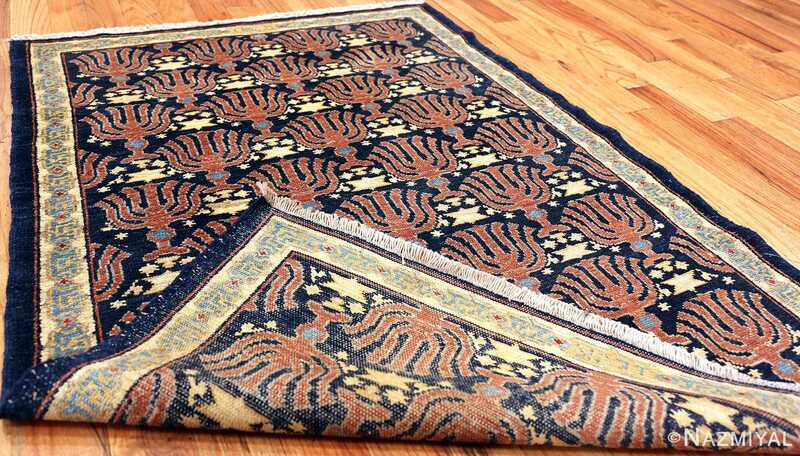 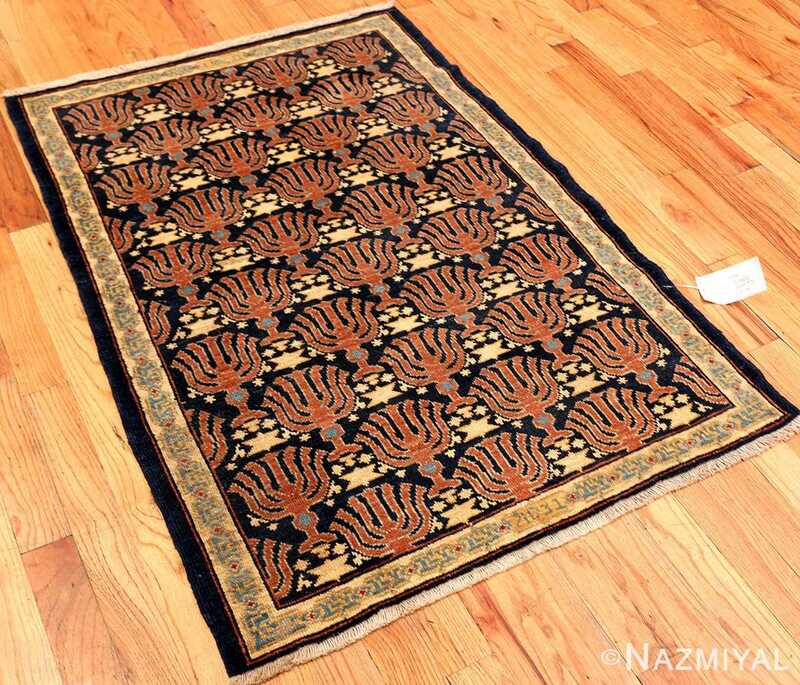 A Highly Artistic Menorah Judaica Motif Small Size Blue Color Background Antique Israeli Bezalel Rug, Country of Origin / Rug Type: Israeli Rugs, Circa Date: 1920 – The menorah is a symbol of light, divinity and wisdom for the Jewish people. 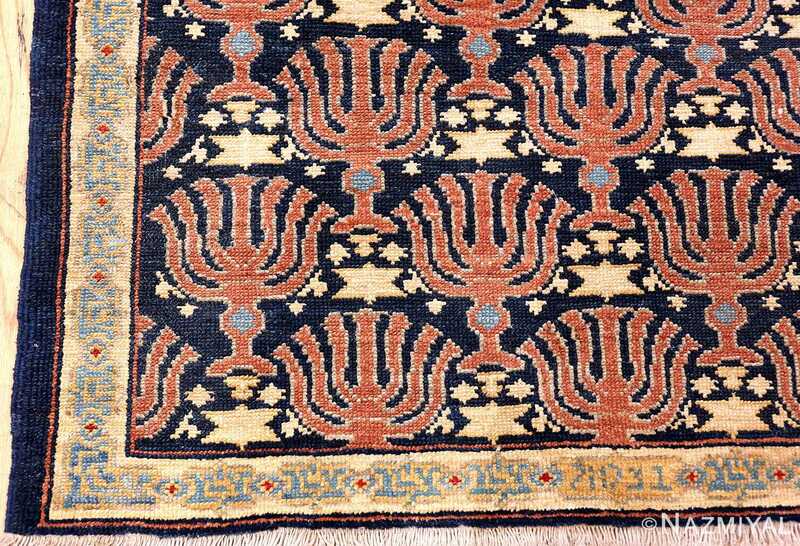 The menorah and Star of David motifs both grace the field of this antique Israeli Bezalel rug in an array of striking red menorahs on a blue background. The colors of this magnificent Israeli rug are high contrast to highlight the symbols and the meaning behind each of them. 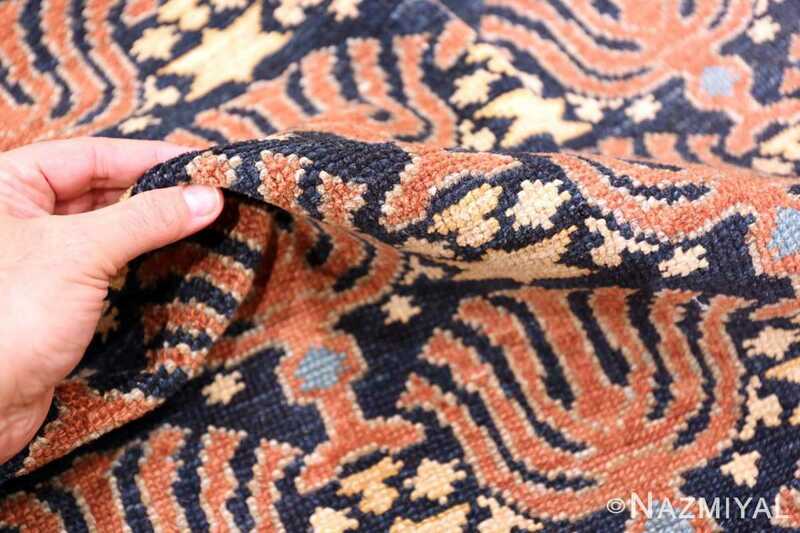 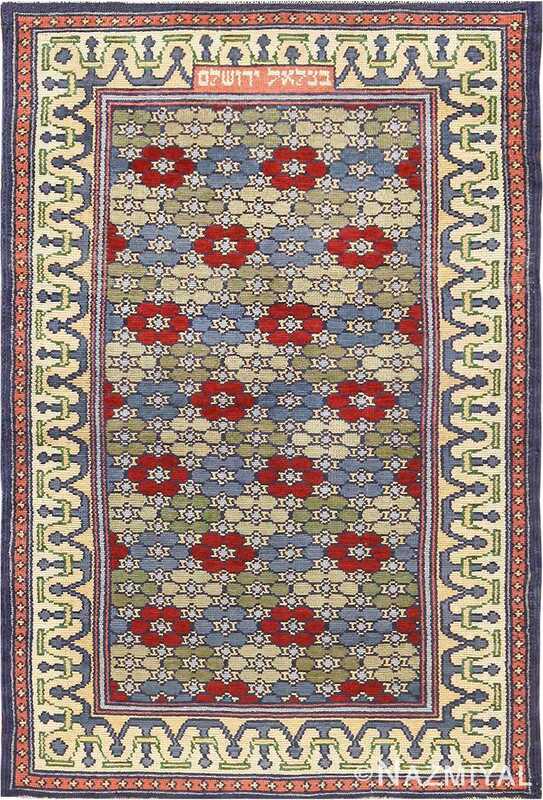 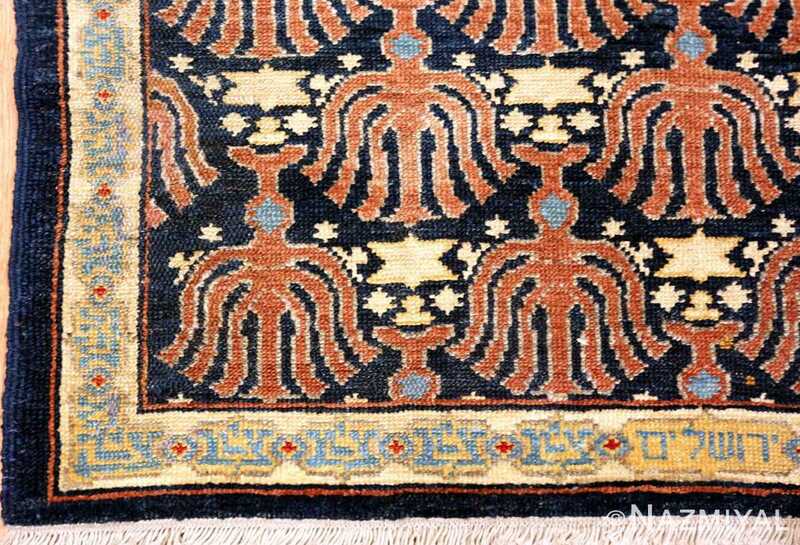 It will make a stunning piece and central focal point or as a wall hanging tapestry rug in any room. 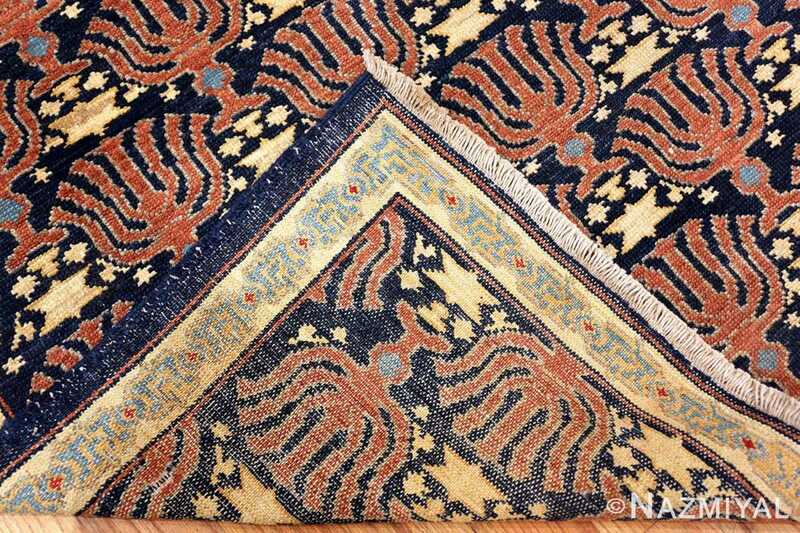 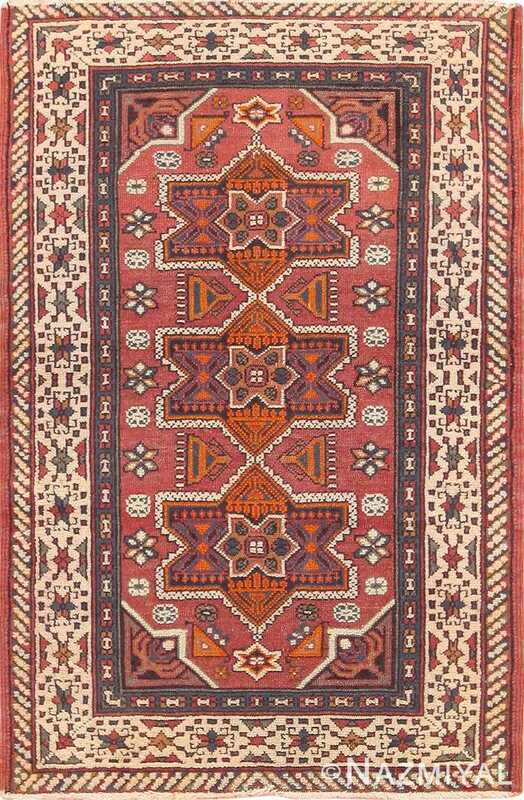 This antique Judiaca rug consists of a main field with an allover design that includes stylized menorahs and the Star of David. The border is understated, compared to the space taken by the field and the central design. 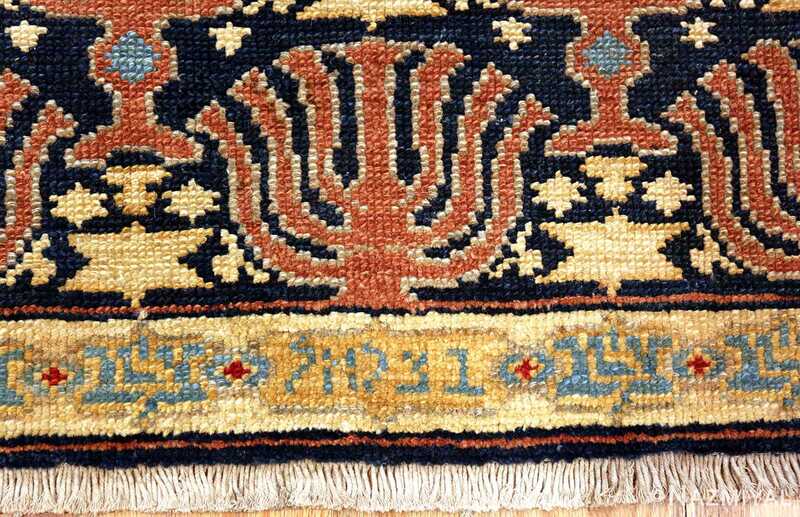 It features a geometric design in the borders and two gold boxes with Hebrew text on both ends – the top one reads “Jerusalem” and the Bottom “Bezalel”. 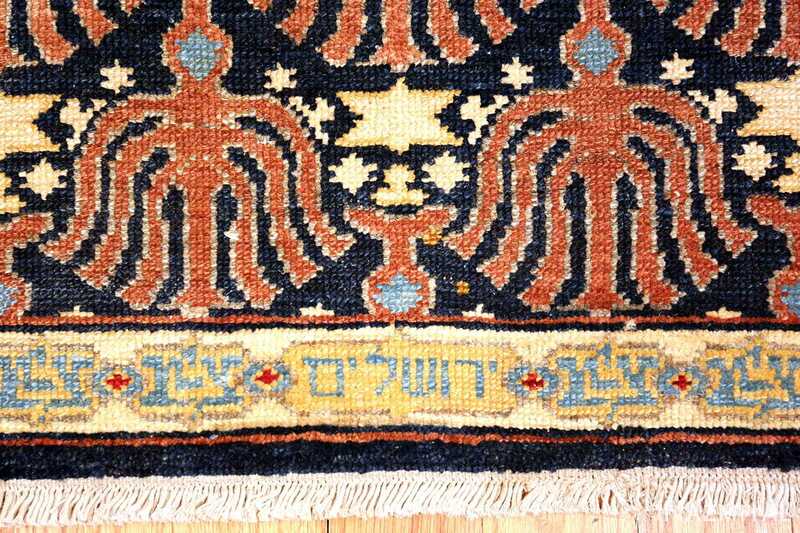 If you look closely, you will find that the antique Israeli Bezalel Menorah rug does have vertical and horizontal symmetry with one of the small Star of David motifs as the central point of the design. 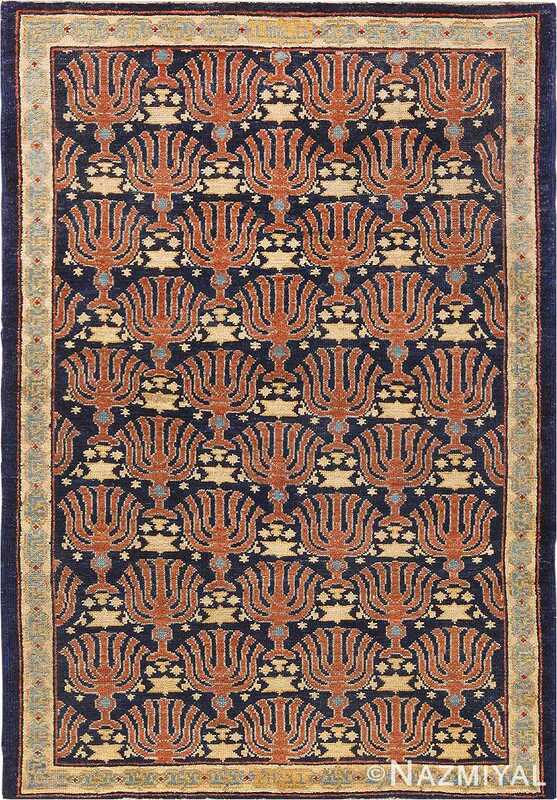 This allover design appears to extend beyond the confines of the border, giving it a sense of larger space and dimension. 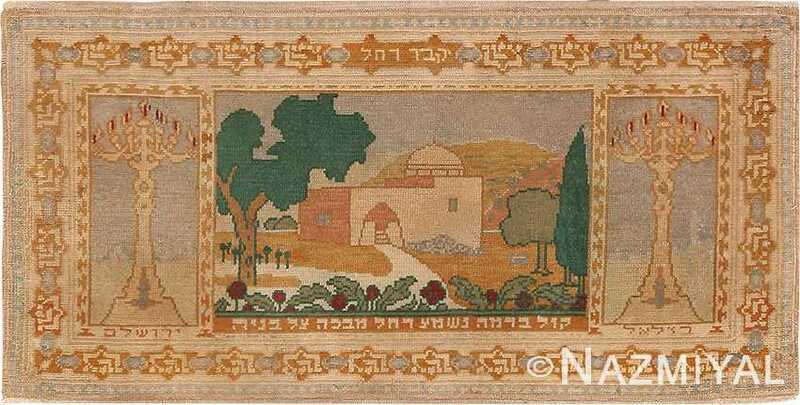 Woven in the Bezalel Art School in Jerusalem Israel, before Israel was even an official state, this is a magnificent piece with special meaning for rug collectors of Judaic art. The colors of the field are still bright and well-preserved, which contrasts with faded colors of the borders. 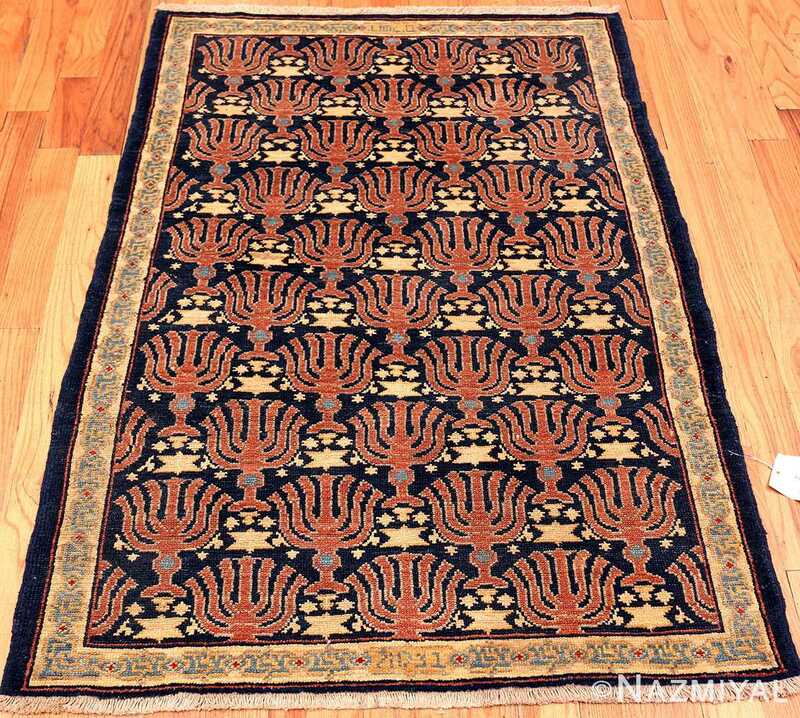 This creates a sense of the passage of time yet with the ability to remain strong. 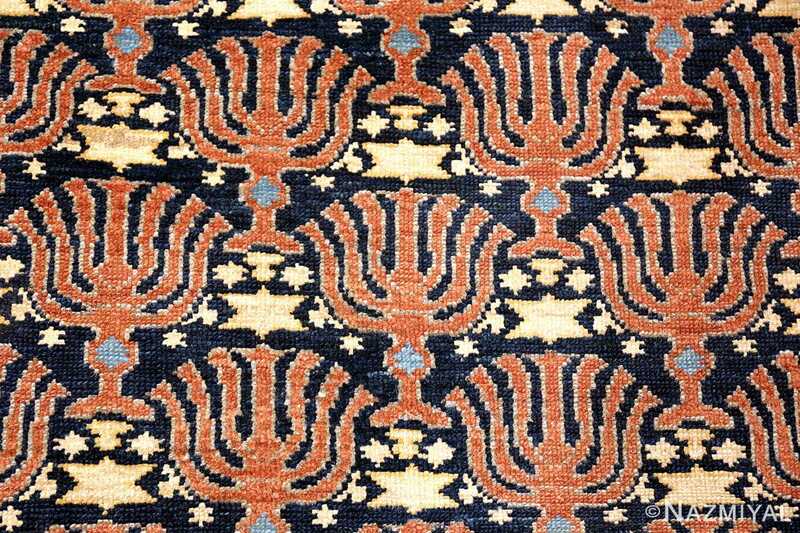 The design of the menorah rug embodies strength and resilience through time and will hold a special place in any collection of Jewish antiquities.